For other people with the same name, see Henry Holland (disambiguation). 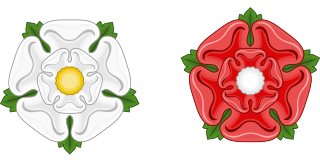 Henry Holland, 3rd Duke of Exeter (27 June 1430 – September 1475) was a Lancastrian leader during the English Wars of the Roses. He was the only son of John Holland, 2nd Duke of Exeter, and his first wife, Lady Anne Stafford. His maternal grandparents were Edmund Stafford, 5th Earl of Stafford, and Anne of Gloucester. He inherited the Dukedom of Exeter when his father died in 1447. A great-grandson of John of Gaunt, he might have had a plausible claim to the throne after the death of Henry VI. However, he was cruel, savagely temperamental and unpredictable, and so had little support. P.M. Kendall describes him as "dangerous", and was seen as "cruel and fierce" by contemporary Italian observers. Exeter was for a time Constable of the Tower of London, and afterwards the rack there came to be called "the Duke of Exeter's daughter". In 1447 he married Anne, the eight-year-old daughter of Richard of York. 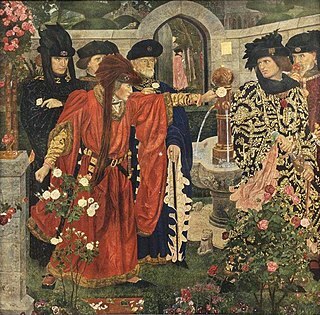 However, in the Wars of the Roses, he remained loyal to Henry VI against the Yorkists. He was imprisoned at Wallingford Castle when York briefly seized power after the First Battle of St Albans in 1455. In 1458 he participated in The Love Day, an attempt at reconciliation between the rival factions. He was a commander at the Lancastrian victories at the Battle of Wakefield in 1460 and the Second Battle of St Albans in 1461, and in the decisive defeat at Towton in 1461. He fled to Scotland after the battle, and then joined Queen Margaret in her exile in France. He was attainted in 1461, and his estates were given to his wife, who separated from him in 1464. During the brief period of Henry VI's restoration he was able to regain many of his estates and posts. At the Battle of Barnet, Exeter commanded the Lancastrian left flank. He was badly wounded and left for dead, but survived. Afterwards he was imprisoned, and Anne divorced him in 1472. He "volunteered" to serve on Edward's 1475 expedition to France. On the return voyage he fell overboard and drowned, his body being found in the sea between Dover and Calais, Fabyan saying "but how he drowned, the certainty is not known". However, Giovanni Panicharolla, the Milanese envoy to the Burgundian court, was told by Duke Charles that the King of England had given specific orders for the sailors to throw his former brother-in-law overboard. Before 30 July 1447, he married Anne of York, the second child and eldest surviving daughter of Richard Plantagenet, 3rd Duke of York, and Lady Cecily Neville. She was an older sister of Edward IV and Richard III. Lady Anne Holland (1461 – between 26 August 1467 and 6 June 1474), who married Thomas Grey, 1st Marquess of Dorset. Since Henry had no legitimate male issue the disposition of his estates became a complex matter for his widow, the dowager Duchess of Exeter. ^ Kendall, P.M. Warwick the Kingmaker. p. 305. ^ Desmond Seward. The Wars of the Roses and the Lives of Five Men and Women in the Fifteenth Century, Constable & Robinson, 2002. pg 240. Griffiths, Ralph A. (1968). "Local Rivalries and National Politics: the Percies, the Nevilles, and the Duke of Exeter, 1452-55". Speculum. Speculum, Vol. 43, No. 4. 43 (4): 589–632. doi:10.2307/2855323. JSTOR 2855323. Pugh, T.B. (1990). "Richard, duke of York, and the rebellion of Henry Holand, duke of Exeter, in May 1454". Historical Research. 63 (152): 248–62. doi:10.1111/j.1468-2281.1990.tb00888.x. Anne of Gloucester, Countess of Stafford was the eldest daughter of Thomas of Woodstock, Duke of Gloucester, and Eleanor de Bohun. John Neville, Baron Neville was an English nobleman and soldier, slain at the Battle of Towton. His son succeeded to the earldom of Westmorland. Edmund Stafford, 5th Earl of Stafford and 1st Baron Audley, KB, KG was the son of Hugh de Stafford, 2nd Earl of Stafford and Philippa de Beauchamp. 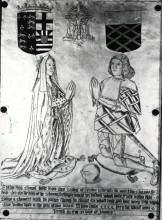 Sir Thomas St Leger KB was the second son of Sir John St Leger (d.1441) of Ulcombe, Kent, and his wife, Margery Donnet. He was also the second husband of Anne of York, daughter of Richard Plantagenet, 3rd Duke of York and thus she was an elder sister of Kings Edward IV (1461-1483) and Richard III (1483-1485). 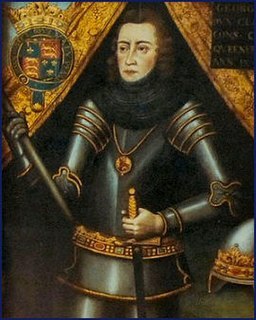 His younger brother, Sir James St Leger of Annery in Devon, married Anne Butler, daughter of Thomas Butler, 7th Earl of Ormond, and was therefore an uncle to Thomas Boleyn, 1st Earl of Wiltshire.